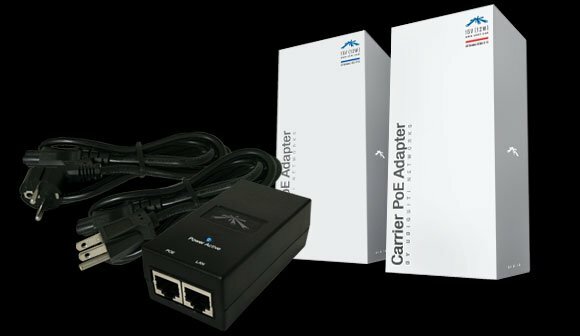 Ubiquiti POE-24 24VDC 24W 120VAC/230VAC Power Over Ethernet POE Designed for BaseStation Equip. Ubiquiti POE-24 24W 90-264VAC , Designed by Ubiquiti for BaseStation Equipment , Power Over Ethernet , USA Version , AC Cable w/Earth Ground, Carrier Class Power over Ethernet System POE , FCC and CE approved , Overload and Short Circuit Protection . Ubiquiti POE-24 24VDC 24W is an advanced power supply / power inserter. The power supply is autoranging on the input and has a regulated voltage output. It has overload and short circuit protection in addition to Ethernet surge suppression builtin. The Ubiquiti POE-24 24W is not a proprietary unit. For all models the power is supplied on ethernet pins 4/5 (V+) and 7/8 (V-). For the models the power is supplied on ethernet pins 4/5 (V-) and 7/8 (V+). Ubiquiti POE-24 24W come complete with a standard North American 115VAC power cord.